The Gentleman Crafter: AND NOW I PRESENT....A DYLUSIONAL PROJECT! Well That's it Folks! I hope you like it! Have an awesome weekend! WOWEE!Your projects are always well worth the wait Jim!! I dare say Miss Dyan Reavely will be absolutely thrilled with your latest Dylusional project!! Wow Jim takes me back to my hippy days lol. Great job love it don't know how you do it. oh wow! that is soooo awesome!!! love it! How fun is this bus? Love it Jim. Made me giggle when I saw Mr Froggy driving. You did Lady Di proud my friend. Thanks for sharing! I want to ride that school bus. Great project Jim. Woot I wish my school bus was this cool. Love it! Thanks for sharing!!! YOu Rocked it out my friend!! you are a super star!!!!!!!!!!! Holy moly!!! This is bloomin brilliant jim!!! I'm up for a road trip in that bus too!!! Wow its fabulous - I have just treated myself to some dylusion sprays but not had chance to play yet - already own half of her stamps! Love all the people and beastpeople in this bus!!! Amazing work Jim! The color and details are fabulous. 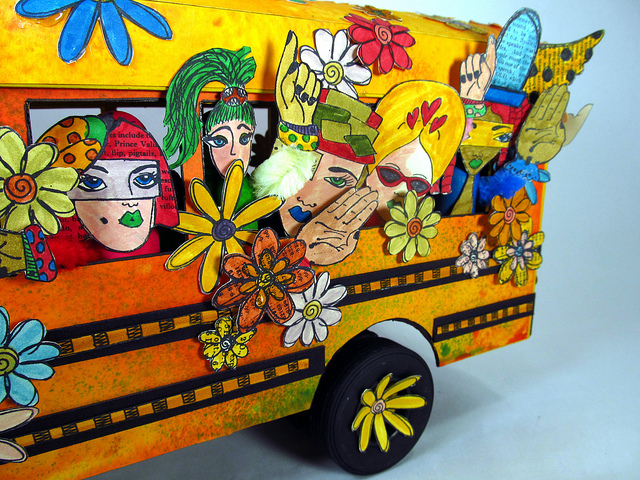 Dyan said this was fabulous and it is, you are so talented, love the bus. Wow, Dyan was right You are amazing! I love it! OMG>>>>so playful, colorful and HAPPY! I love, love, love, love, love it! And, where'd you get the photos of all the kids I went to school with back in the 70's? LOL Really, Jim...you just keep getting better and better! as always fantastical work!!! in awe of your creativity! WOW... 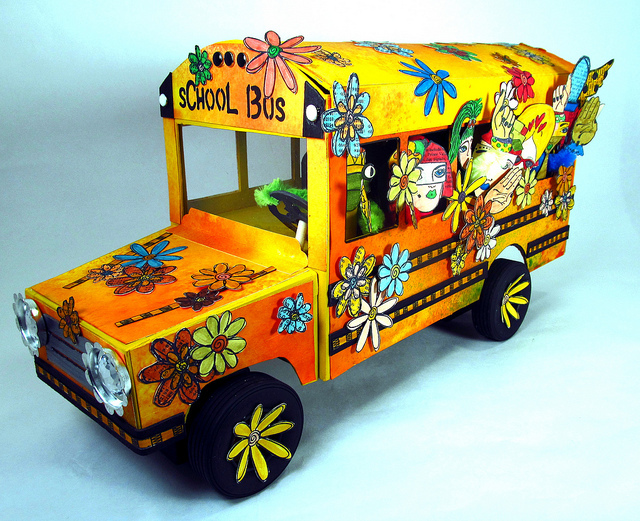 I would go back to school if I could ride a bus like that... fantastic work here and oh, so creative!!! I am totally amazed by your project and I love how you think outside the box with your fantastic 3D crafting. I have created a tag for the challenge but I'm almost embarrassed to link it now! You are Inspirational! Once again, a totally awesome project Jim! You never cease to amaze. I find Dylusion sprays and stamps very therapuetic and of course great fun. It really does bring back memories of the Partridge Family. Makes me smile! Reminds me of the Partridge Family bus! Great job! I cant help but smile when looking at it. The vibrant colors and fanciful people are awesome. Brings me back too..... You're a treasure Jim. I really really love what you create~!!! Its wonderfull.... going to vistit your blog every day..
Wow...how fun! Love the colors and the stamps you used, and that adorable frog driver! Reminds me when I was young and would watch the Partridge family ride on their fun bus! How I wanted one!! Thanks for sharing. You are so talented. I can tell you had tons of fun making this!! It's fun to look at!! As others have said... it reminds me too of the Partridge Family bus. Your amazing project just goes to show we all have an inner hippie!! I love it!!! Oh my gosh! This is absolutely stunning and I can see that you had a blast making this beauty! ooooooh sorry..forgot to mention the the cool background..are those your dylusional leaves??? WOW - WHERE ARE MY SUNGLASSES!!!!! !....my twin grandbabies would love this bus! FAR-OUT!!! That's what we used to say back in the 70's when something was awesome. 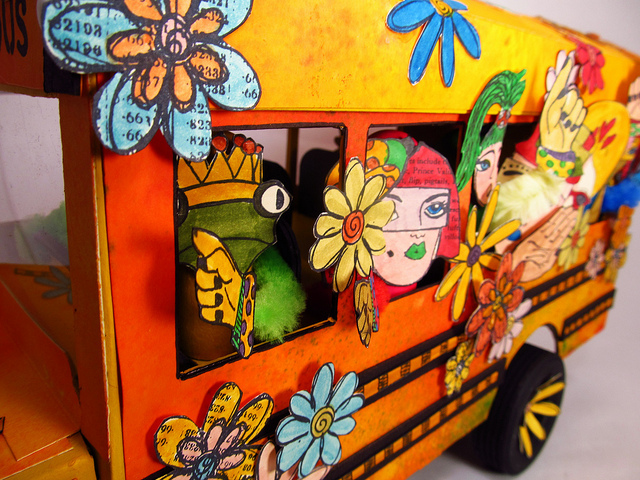 I love the frog driving the bus, and the passengers hanging out the windows, PRICELESS! Loving your new fall background on the blog. Happy Fall y'all! You are forgiven for coming to the bus stop late! This is really fun! I think I see myself looking out the back window. I ADORE the headlights. Now if you can get this bus to run over the scorpions and tarantulas, you really have something. Glad you survived the weekend almost intact and was still able to create! Loving this project - what incredible inspiration! Thanks for sharing. The scary part is the people in thebus look my college crowd from the 60's..And one of them even had a vw bus with flowers....um .....but I was a mere child .....just sayin!!!!! OMG!! Are you from this planet? Your creations are out of this world amazing!! Wow can't stop smiling...I want to touch and look in the windows so I don't miss anything or anybody! Wow! Are you sure you aren't a child from the 60's??? LOL Takes me back to my Flower Power days. All I can say is....ROAD TRIP!!! Who's up for one??? i love the green driver. looked all over and still can't find susan. ok enuf of the funny. this is a great idea and so time appropriate. very clever m'boy! That's one wild and wicked school bus Jim. Looks like a great way to spend your weekend - sore toe propped up and inky fingers, as you were dreaming up this fun project. Like I have been saying, your definitely on a roll. What's next Scorpion King???????? You rocked this one. I'm good to see that the scorpian and tarantula's haven't affected your brillian creative mind at all. This is awesome...I thought of the partridge family bus immediately. Another job well done my friend. I love it! This is FABULOUS! I am so in love with this project. BRILLIANT! 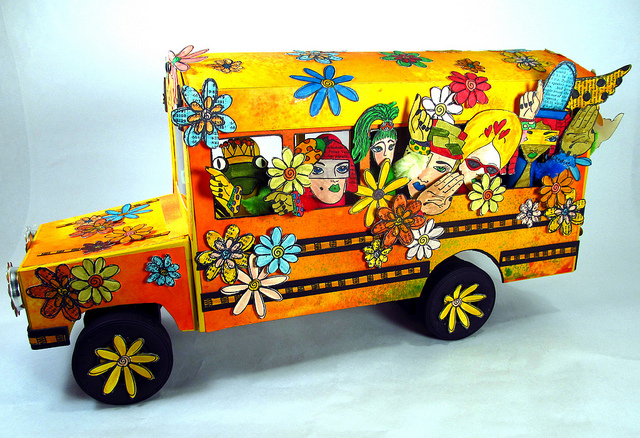 Your amazing bus just radiates pure JOY! I know it takes a lot of us on a time-travel trip back to the sixties - it sure does me. You took Dyan and her products and ran with them to the max. Wonderful. After Friday night, I don't know how you resisted adding Dyan's spider stamp to the bus. Lol.Thanks very much for sharing this with us. By the way, I love your new background. What a fun bus! You have done Dyan proud - it is fabulous! I love your new leafy background too. So very groovy. Started humming the partridge family theme song-C'mon get happy! A whole lotta loving' is what we'll be bringing'. Wow, I just dated myself! You are certainly one talented dude. Thank you for sharing. "The wheels on the bus go round and round all day long". omg Jim this is utterly, utterly fantastic. 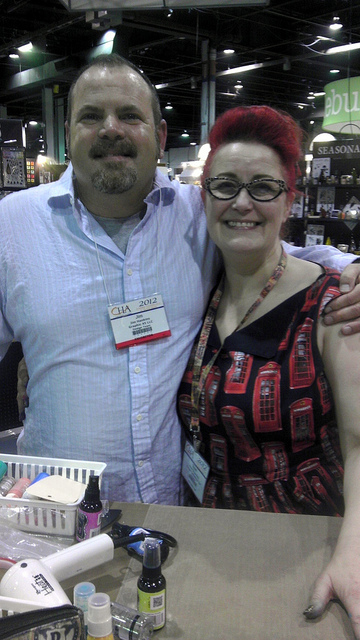 You are one amazing Dylusional'gentleman crafter'! Love it, love it, love it! lol Susiesu ps Dyan Revealey sent me and sent you big snogs - MWAH! Reading the comments is so much fun. Love the bus and I would gladly join the touring company. Great job. thanks as always for sharing. what a wonderful job! I swear Mr Gentlman, you are so talented and you absolutely crack me up! Yours is one of the few blogs I HAVE to visit every day! Thanks for the inspiration and the laughs! I love the school bus. Will you be writting a tutorial? My friend ownes a school bus company, and my husband drives a bus. Years ago I drove a van route. Love the bus. Wonderful, Jim--love the Froggy driver! Does the chipboard get soggy when you spray it? Do you spray before or after putting the bus together? Anyhow, very cool tribute to Dyan! Every superlative you can think of, times a million. Just awe-inspiring. LOVE, LOVE, LOVE all the bright wonderful colors. This is just genious. Dylusionally Fun ... "I'll take that ride !" I love it ! Tomorrow the world, well, I think you've covered that, or how about the moon! Love it. Truly Dylally! (via Dylan's blog and the Fan FB page!) EmmG, Bristol, England. That bus is so awesome! Groovy, man! Well I'll be da....rned! It's the Partridge Family! lol I grew up in the 60's, so I saw many buses painted just this way! Beautiful job Jim. I can't help but sing the partridge family in my head! This is so crazy cool!!! You are awesome!!!!!!!!! Jim, you really do have to stop sneaking around my house and peeking at my friends! Again another perfet project for my dearest friend and close neighbor who IS A Bus Driver! So guess I will be using this set of pictures to make a bus next (just as soon as I finish the lighthouse lol) Now if you could just take a break and visit someone else's house I would appreciate it :) Thanks for sharing and definitely inspiring! That is one stunning piece of work! Jim first time visitor after Dyan mentioned your blog OH MY Goodness! 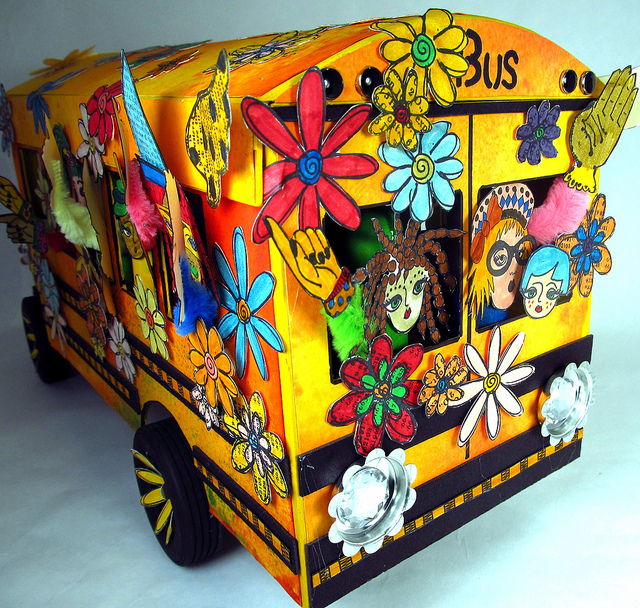 I love the bus I put it on my blog with a link to yours to share with all my followers hope that was ok. Love your creations!!!! That is crazy cool and so awesome! Good for you! I love to keep visiting your site to see this bus! Fabulous! Really fun!!! All of you're work is amazing. Thanks for sharing you art... I'm your newest fan.